If you are on breakfast duty for the family or having friends over for brunch, this recipe is the one for you! While the aubergines, tomatoes and sweet potato chunks are roasting in the oven, you can prep the table and make yourself a coffee. Just place the wraps on the table and everyone can help themselves. With zero fuss this a perfect option for an extremely delicious veggie filled breakfast! Place the aubergine chunks on a baking tray and drizzle with the olive oil and soy sauce. Cook for 20-25 minutes. After about 15 minutes, add the cherry tomatoes to the tray. On a separate tray place the Garlic Sweet Potato Chunks and cook as per instructions on the pack. While the chunks and aubergine cook, make the relish and dressing. For the relish mix all ingredients together, the same goes for the dressing. 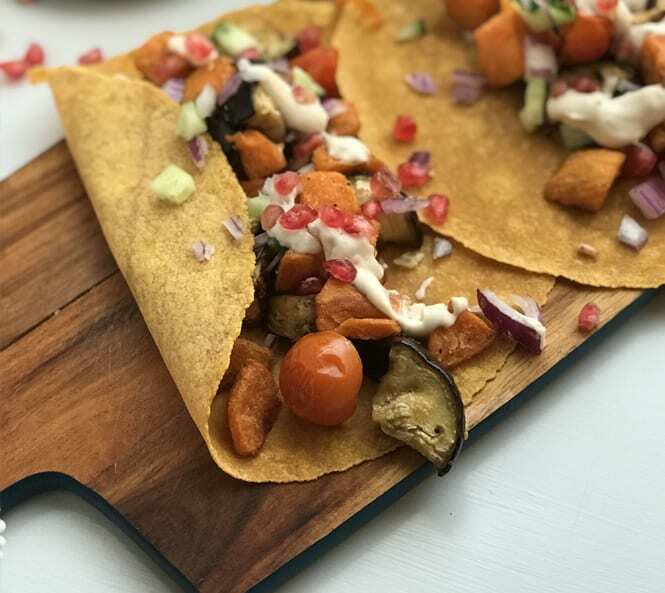 Serve all on wraps of your choice, we have used BFree Sweet Potato Wraps.